On TracesOfWar.com we recently reviewed the book "The Polish 'Few'", which was published by Pen & Sword. 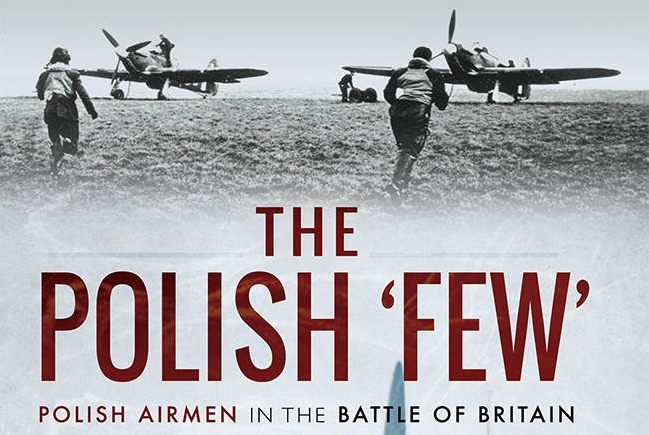 It's about Polish airmen in the Battle of Britain. We asked the author Peter Sikora some questions by e-mail. We’ve reviewed your book “The Polish Few”. You have a special interest in the early Polish Air Force and the Polish participation in the Battle of England and World War Two. Where does your fascination come from? Let’s start with short clarification. There was no such thing as an ‘early Polish Air Force’, as this term has never been used neither in Poland, where an air arm of the armed forces had functioned as it’s integral part known under various names, the most popular was ‘Lotnictwo Wojskowe’ (Military Aviation), nor in France in 1940. It was only in Britain, where the Polish Air Force began its history as an independent structure of the Polish Armed Forces in exile, flying under operational and logistical command of the RAF, rather than being part of it. Going back to your question, I thought that it is necessary to bring this story to the attention of non-Polish readers, as Polish airmen, flying and ground crews, played an important role in the Battle of Britain. I always loved history, which wasn’t easy in Poland ruled by the communist regime controlled by the Soviets. We were taught ‘their’ version of history of Poland. Despite this, I got the ‘history bug’ very early from my father, who was himself a part of the Polish Air Force. Furthermore, I was encouraged by my history teacher, who even allowed me to lead history lessons on his behalf. Writing this extensive and well-documented book will have taken a long time. How long did it take before this book was finished? From the idea to the publication of the first edition. I must admit that it was the Publisher who approached me with this offer, and knowing Pen&Sword’s reputation, I did not wait to respond. It took me around 1,5 years to complete it, however it is difficult to say whether the book is completed or not, as there are new materials surfacing regularly. I am lucky to have so much material that I gathered over the years. How did you complete the whole story? Did you use second hand stories, testimonies, interviews or other documents? Where did you find the information for the biographies of all pilots in chapter 2? I always use all available sources, this is an integral part of a comprehensive preparation, which I crafted for the last 10 years when writing my previous 8 books. Yet to achieve the most clear and accurate picture, I compare all materials. That’s the beauty of writing a historical book; you are often dealing with conflicting data. I had the biographical part almost ready; this is the result of my long lasting research. There were however some new information, mostly obtained from the families of the Polish Few. Did you get any help in deepening all the storylines and if so by whom? Have you for example had support from veteran clubs or association of various squadrons? Of course. It would not be possible to write this kind of a book without an assistance. All the benefactors are mentioned at the beginning of ‘The Polish Few’ and I do not want to speculate who contributed the most, as all their help was amazing. I was lucky to meet some of the Polish Few years ago, but now they are all gone. Last Polish veteran of the Battle of Britain passed away in 2011, with the Polish Air Force Association being closed one year before. Were some parts of this history easier to research than others? Poland was a communist country for a while, so maybe not all archives were preserved and information wasn’t accessible for a long time. For a while? Well, for us, Poles, fifty years was a very long, dark time of living in terror under occupation of the neighbour that hated us. Poland was ruled by the government that was installed against our choice. Something that Westerners have not experienced after the war. The Battle of Britain was fought over Britain, therefore all the archives are here, in the UK. Yes, you are right. Most of our – Polish – archives were lost during German and Soviet occupation, but these related to my book survived purely because they are here, in Britain. How did you manage to keep the overview with so much information and process it into chronological order? I hope that I did. Easiest answer would be: by spending countless sleepless nights and also by double checking everything that I wrote. Did it work? I am only human, so mistakes are likely to happen. What are the reactions in Poland and Britain to your book about an underestimated group of heroic people? This men did not have an easy life after the war, their homeland taken over by the communist, having to adopt the British nationality and with much incomprehension and ungratefulness in the European countries for their share and sacrifices. I know very little about reactions in Poland as my book was published in Britain and in English. Perhaps someone will decide to have a Polish version too. At the same time I was overwhelmed by numerous complements and good reception of ‘The Polish Few’ in Britain and in other countries. I received many invitations to promote the subject and I am glad that I was able to bring attention to this chapter of our history. If you ask about how Poles found themselves after the war, I would say that in most cases, this difficulty not applied to Poles only, the Battle of Britain veterans, regardless of their nationality, had to face a normal life, quite often finding non-military related careers. Life was going on, this war was over. It’s true that Poles were in extremely difficult position. Their country was handed over to Stalin, by the Allies, which were considered the most loyal friends of Poland. Poland only changed one oppressor to another and those veterans who returned from the West were treated as enemies of the state. Some ended up in prison, some were even executed, most of them were facing various forms of repression. Those who decided to stay in Britain, quite often were facing exclusion too. Britain that suffered a lot recently was in a bad shape and it was obvious that the priority on the job market would be offered to British ex-soldiers. Poles were politely asked to leave, therefore some of them eventually did, making United States, Australia, Canada, South America or Africa their new homes. Is there a chapter or person described in this book which has a special meaning for you? No, all are equally important despite the fact that some aspects are mentioned for the first time in English. For example long lasting Polish and British aviation contacts before the war and participation of both Polish bomber squadrons in attacking German invasion fleet, which – in my opinion – was directly related to Battle of Britain. There also were Dutch RAF squadrons in World War Two. Are the Polish and Dutch squadrons comparable or not? What could Dutch readers learn from your book? First of all, the Polish squadrons were Polish Air Force squadrons commanded by the RAF, not being part of the RAF, so that would be the first difference. Secondly Poles numerically and structurally had much bigger air force in Britain consisting of 14 operational squadrons, not to mention many other units, flying schools and 17,000 men and women serving in the PAF, which can be compared to three Dutch squadrons. Finally, the Dutch airmen fought bravely and regained their freedom in 1945, whilst Poles were among those nations who lost the war. Polish airmen were aware of Yalta and Tehran decisions, yet they stood on the Allied side to the end fighting for other’s freedom. 06-03: "The role of the Dutch Resistance in the war is totally under-estimated"